UPDATED AS CONTEST HAS ENDED: Thanks to everyone who participated via Facebook and Pinterest! We had over 30 entries! You can see the video on Facebook of the winner being selected (and me singing a bit of The Cure), but the short story is: Congratulations to Mandy! You won the Salted Caramel Sugar. 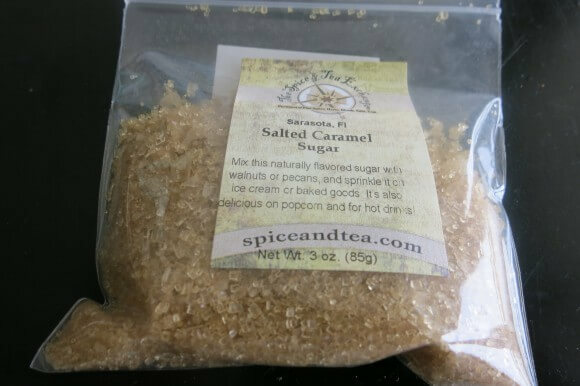 Let me just start by saying that 1) you are lucky that I already announced that I would give away a package of the Salted Caramel Sugar and 2) that I can purchase more on line from the Spice and Tea Exchange*. Otherwise I would be keeping all of it for myself. Because this stuff is GOOD. 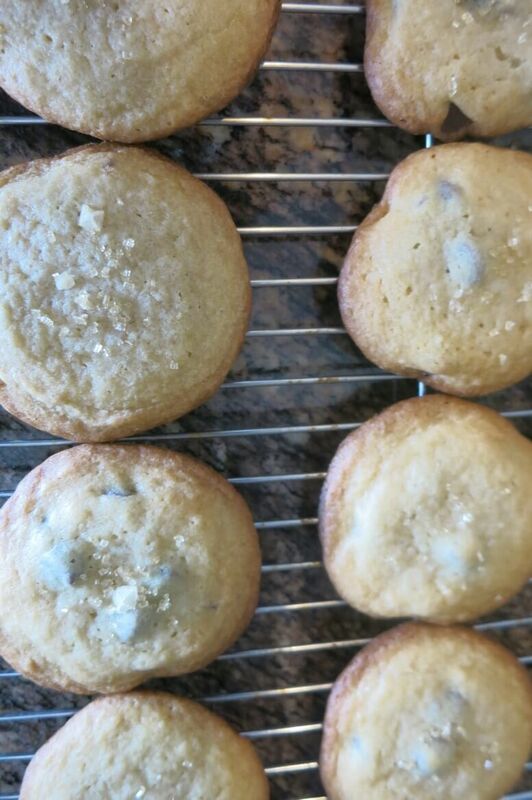 I made chocolate chip cookies today. I sprinkled some salted caramel sugar on top before baking. In the interest of making sure this was the best way to make them I immediately tried one as soon as it came out of the oven. Sadly, I wasn’t feeling the sugar love. So for the next batch I sprinkled the salted caramel sugar on as soon as they came out of the oven. And then immediately tried one. Much much better. But as I really wanted to be thorough, for the third batch I went back to putting on before baking, but increasing the amount as I had been a bit stingy with the first batch. Which is why I need more of the sugar so I won’t feel like I need to hoard it. Increasing the amount definitely made a difference. 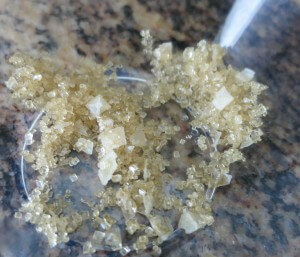 My end opinion is that the sugar be (semi-generously) added immediately after removing from oven. 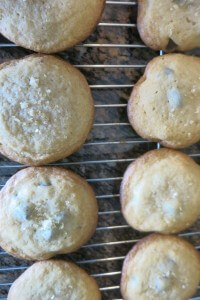 So if you win this giveaway, use your favorite chocolate chip recipe and then enjoy. And if you chose to enjoy them all by yourself, without sharing with family or friends, know that I totally understand and support your decision. 1). Pinterest – Go to my Pinterest board titled “One Missing Ingredient Blog”. Repin one of my recipes that you can find there. It is very important that you pin this way, as I will receive a notification saying you did it. If you pin from my blog (which I do normally love and appreciate), I know that it was pinned, but I don’t know by who. Likewise, if you repin from someone else’s pin, I don’t know about that either. Although again, normally love and appreciate you doing that. And in future, feel free to continue pinning any way you chose to pin. But for purposes of this, I need to know you pinned so you can qualify for a chance to win. And, for every recipe you pin, you will get one entry. So pin them all and increase your chances! 2) Facebook – for this one you can share directly from the discoverph.com website, using the handy share button that is provided at bottom of each entry. Now, again, it is very important you do this a certain way. When you share (and you can share any entry, it does to have to be this one), you need to tag me in whatever you chose to write when you share it (obviously, the wittier and more praise worthy, the better 😉 ). If you don’t tag me, then again, I will know that entry was shared, but I won’t know by who, and I can’t give you credit. And you want credit! And like with Pinterest, for every entry you share, you will get one entry into the contest. So annoy your friends and share them all! And if you are not able to tag AZtrophywife when you share, then please either tag in a comment or send me a message here to get credit. Sorry for extra step, but apparently, there is a problem tagging in the share, and again, if I’m not tagged I don’t know. Contest ends Friday at midnight my time (which is whatever time zone Florida is in, which is currently three hours ahead of California and Arizona). Good luck! PS – If you win, I also highly recommend keeping it simple and just sprinkling the sugar over some vanilla ice cream. YUM! * This is not a sponsored giveaway from The Spice and Tea Exchange. 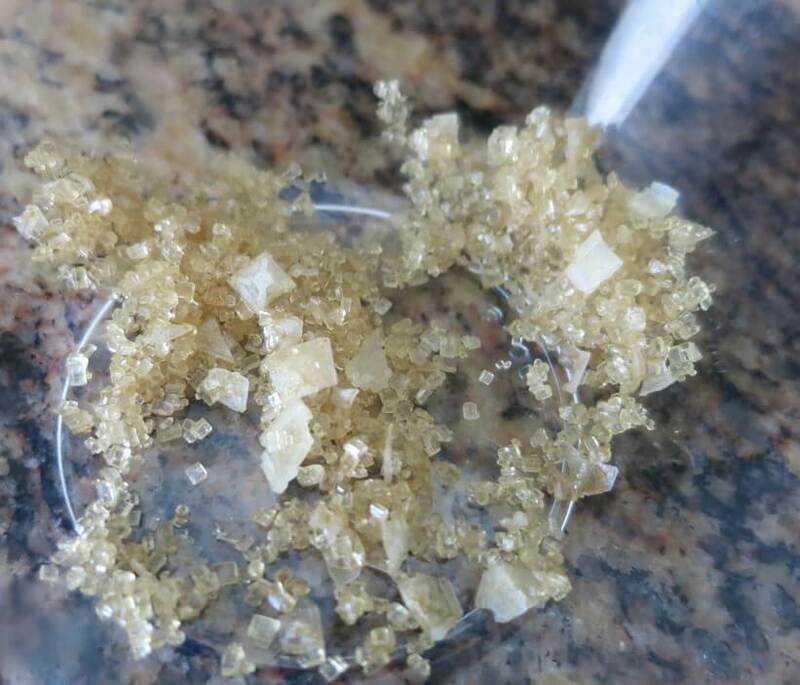 I just was really blown away by this sugar when I went into their store on a recent trip to Sarasota, FL and thought it would be a great giveaway. That said, if they happen to stumble upon this and want to sponsor a giveaway in the future, done! Call me!